Who is Father Syvinski and why did he sign this image? Henry Bronislaw Syvinski (1919-1999), a native of Amesbury, Mass., graduated from Villanova College (it was not yet a university) in 1944 with a bachelor’s degree. He was ordained a priest in 1947 after studying theology at Augustinian College, Washington, D.C. The Rev. Henry B. Syvinski, OSA, continued his studies at Catholic University, Washington, D.C., and in 1948 he received a master’s degree in fine arts. Father Syvinski’s first assignment was in the parish of St. James, Carthage, N.Y. After serving in several other positions over the next ten years, he came to Villanova where he remained for the rest of his life. In January 1958, Father Syvinski became a professor at Villanova University, teaching various courses in religion and fine arts until retiring in 1987. He was also associated with the swim team, University band, Student Art Club and the Glee Club. Father Syvinski offered painting classes to the residents of St. Thomas of Villanova Monastery. In addition to all of these activities he continued to create art, creating wood carvings, designing mosaics for four altars in St. Mary’s Hall and designing the mosaic that bears his signature in Falvey’s entrance. 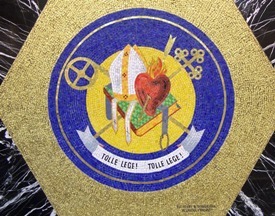 The Province of St. Thomas of Villanova, which Father Syvinski’s mosaic represents, is one of three American provinces and the one which sponsors Villanova University. This seal, replaced by a new design in 1997, includes some of the same symbols as the University seal: a cross, a crosier, a flaming heart pierced by an arrow, a book and a cincture lying on the book. Father Syvinski’s design includes a bishop’s mitre and an inscription, “Tolle lege! Tolle lege!” (Take up and read), which is particularly appropriate for this seal’s location: the entrance to a library. The bishop’s mitre refers to St. Augustine’s role as Bishop of Hippo. “Tolle lege! Tolle lege!” comes from St. Augustine’s Confessions, Book 8, Chapter XII, as part of the explanation of the saint’s conversion to Christianity. The book featured in both seals depicts the Bible, through which St. Augustine began his conversion, and also symbolizes his dedication to learning. The burning hearts symbolize St. Augustine’s love of God and others. The crosiers (bishops’ staffs) represent the saint’s role as Bishop of Hippo. The crosses symbolize St. Augustine’s conversion and commitment to Christianity. For a full explanation of the University seal, see Villanova University Student Handbook 2011-2012, “The Seal of the University,” available online. A mosaic is an image or design created by embedding small pieces of colored glass, tile or stone (tesserae) in mortar on a hard surface. Golden tesserae are traditionally made by embedding gold foil between sheets of clear glass and then cutting the tesserae to size. The use of mosaics begins with the Sumerians, c. 3,000-2,600 B.C., who first created geometric designs using clay pegs set in mud and later used pieces of limestone and mother-of-pearl set in bitumen. The ancient Romans were master mosaicists and the early Christians learned from them. Mosaics continued to be popular church decorations until the Renaissance (c.1400-1600). They are rarely used for large scale decorations today because the technique is extremely labor-intensive. Article and photography contributed by Alice Bampton, who often serves as resident art historian.